Find thousands of products for your home restoration and renovation projects in the Van Dykes catalog of cabinet hardware, decorative wood items and accents for the kitchen, bath and outdoor living. 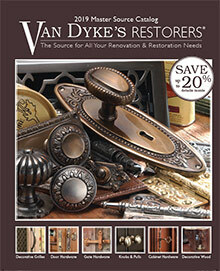 Enter coupon code - FABVD - at checkout on the Van Dyke's Restorer's website. *Coupon cannot be combined with other coupon offers or applied to previous orders. Not valid on items shipped from vendor, furniture, kits, specialty stock items, international or wholesale orders.